LGNPC, or The Less Generic NPCs Project, is a large ongoing mod that aims to write unique, engaging dialogue for all non-playable characters in Morrowind. This is no small goal, as there are over a thousand of characters, and each needs 2-3 pages of dialogue at the very least. Due to the size of the project, it is being released in parts, as a separate plugin for each city. You can download the cities completed so far at the official LGNPC website. 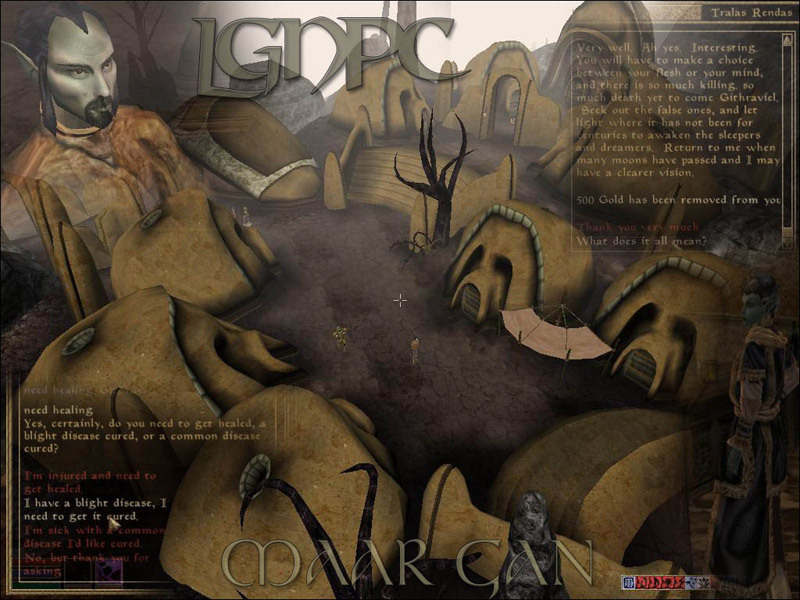 LGNPC started as a single mod for the town of Seyda Need, written by Joe Stevens. This mod was picked up by Tom (Dark Master), the founder of the current project, and he and Blake wrote dialogue for the whole of Ald Velothi. The next city, Khuul, was written by half a dozen people. Maar Gan (during which I joined) by about a dozen. The team continued to grow, although it experienced the ebb and flow of members, like every community project. At its peak we had 25 or so writers. After Ald'ruhn, the project's sixth and largest city, Tom had some health issues that prevented him from participating as actively, and I took over the project for the time it took us to complete two medium-size cities, Pelagiad and Tel Mora. At that point I got distracted by a lot of real life concerns, and felt that I had no time to dedicate to leading a project like this, and the baton was passed to Cyrano who has kept the project alive since then. Although I originally joined as a scripter to allow writers to incorporate quests into their dialogues, I ended up as a manager, or more appropriately, a jack of all trades. I still did all the scripting, but I also wrote some dialogue, edited and proofread other member's submissions, made the posters, worked with TESCS, and posted release announcements. Basically did all the little things that a project of this size needs, so that the writers didn't have to worry about them. When finally taking the back seat after Tel Mora, my responsibilities shifted to just managing the the site, which I still do. NOTE: All nicknames on this pages refer to usernames on the Bethesda Softworks forum.